Indeed, Black representation in pop culture has expanded in recent years. Television shows such as “Insecure,” “Empire” and “Black-ish” feature predominantly Black casts. Films like the comedy-horror “Get Out” satirize racial disparities, while “Hidden Figures” and “Moonlight” portray different Black realities. But “Black Panther” forms a category all its own: Black superheroes and superheroines in a sci-fi world. Lupita Nyong’o (L) and Chadwick Boseman at the Los Angeles World Premiere of Marvel Studios’ “Black Panther” at Dolby Theater, Jan. 29, 2018 in Hollywood, Calif.
Take Wakanda, the fictional nation in which “Black Panther” is based. Wakanda is particularly evocative because it re-envisions reality. It asks not what is, but what could be. Imagine if racism, poverty, and chronic illness –- all risk factors for depression and anxiety disorders among Black Americans –- simply did not exist. They don’t in Wakanda. Chadwick Boseman attends the screening of Marvel Studios’ “Black Panther” hosted by The Cinema Society, Feb. 13, 2018 in New York City. Chadwick Boseman and Michael B. Jordan in a scene from “Black Panther,” 2018. 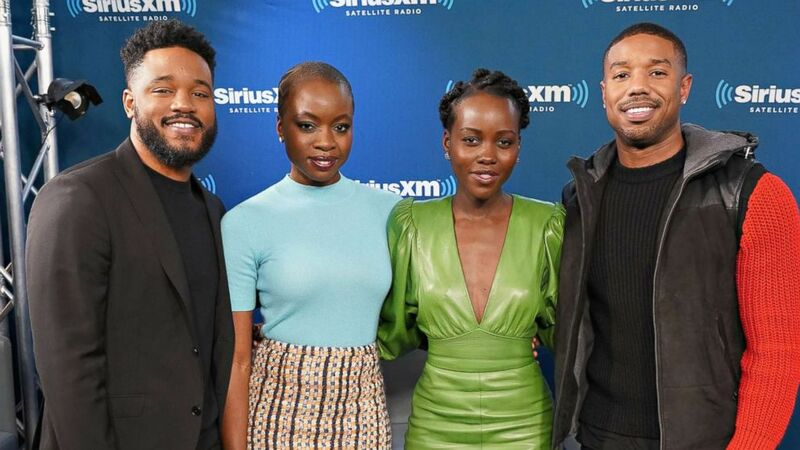 Director Ryan Coogler and actors Danai Gurira, Lupita Nyong’o and Michael B. Jordan take part in SiriusXM’s Town Hall with the cast of Black Panther hosted by SiriusXM’s Sway Calloway, Feb. 13, 2018 in New York City. Christy Duan is a psychiatry resident physician at Zucker Hillside Hospital in New York and a resident at the ABC News Medical Unit. Read more of her work at www.christyduan.com.